This win is for you!!! Francesco Cigarini, you and all team risk lifes for just over 2 seconds a stop. Sorry, you got hurt doing what you love, heres to full speedy recovery my friend. Hope you come back very soon! Hope to see you on track soon...!! Win dedicated to your efforts. Forza Francesco! That win is for him! Great to see incredible support, showing that Ferrari is like a family. Evening Rob! Are you looking forward to the opener at Spa? Are the AF boys close to the GP team? Do they all know each other personally? 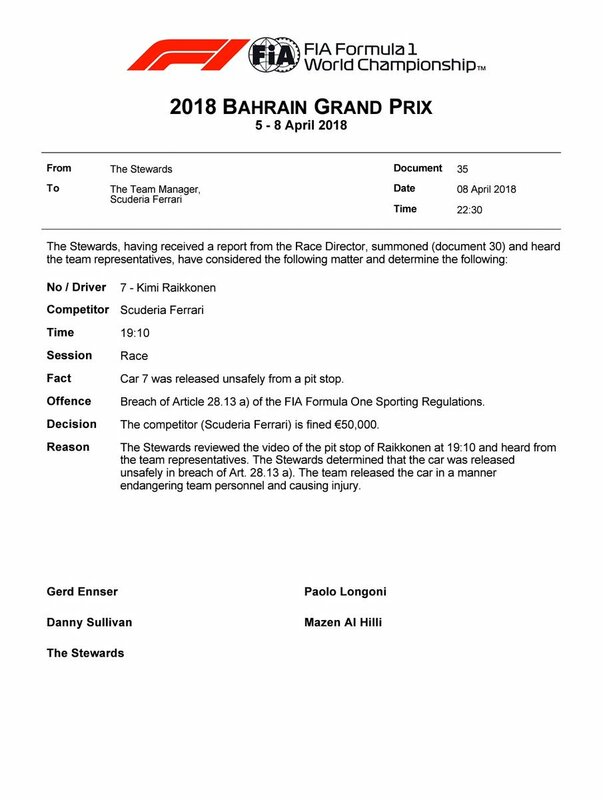 Ferrari fined for endangering team personnel and causing injury. So sorry for your injury Francesco, I hope you have a speedy and complete recovery! FORZA FRANCESCO!!! FORZA FERRARI!!! GOOD NEWS TIFOSI. Francesco is okay and gives everyone a thumbs up!!!! That is great to see and hear that he is ok and in good spirits. I too wish him a speedy recovery and can't wait to see him back in the pits working with the team. Very good news indeed. Speedy recovery Francesco ! I hope Ferrari and F1 look after him financially. He’ll be out of action for a loooong time. Forza Francesco. Ferrari is a family and family look after each other. in Countries like Italy, Spain and France Family value is an integral part of their community. It looked really bad from the camera. Get week soon man, we are counting on you ! Introducing minimum pit-stop times will look rather mundane and boring and still won't guarantee zero risks, and let's not forget that the vast majority of stops are just fine. I think the teams have to back off on this one and go for consistently rapid rather than impossibly fast stops. Raikkonen called Cigarini who is already on his feet! Pit stops are fine, they just need to further improve the green light system. This is the exact same accident that happened in Singapore 2008, but the accident could've been bigger back then because of refuelling.